There are bellylaughs by the bucketful in the hit comedy starring Adam Sandler as a crazed Cajun lad who loses his job as waterboy/punching bag for a top Louisiana university football team and is hired by a sadsack college squad. 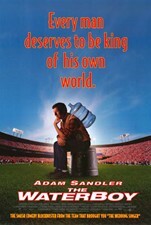 When Sandler's repressed anger explodes, he becomes the team's newest defensive tackle and a gridiron hero. Kathy Bates, Henry Winkler, and Fairuza Balk also star. 90 min. Widescreen; Soundtracks: English Dolby Digital 5.1, French Dolby Digital stereo; "making of" featurette; theatrical trailer; scene access. Adam Sandler ... Robert 'Bobby' Boucher Jr.